Connect to Wifi to avoid cellular data charges for video streaming. 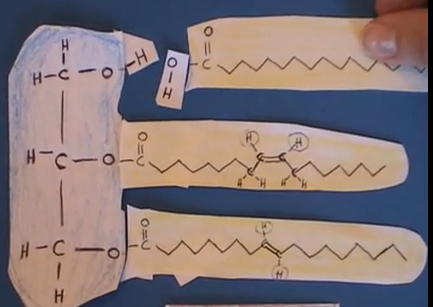 This video discusses the chemical structure of fatty acids. What does saturated or unsaturated refer to? What is the difference between a cis and trans isomer? This diagram represents the chemical structure of a saturated fatty acid. The long zig-zag, (line-angle formula) component represents a long string of -CH2-CH2-CH2 bonds which terminate in a methyl group (-CH3). This methyl terminal carbon is numbered omega 1 when identifying the carbon molecules in the fatty acid chain. Each vertex in the line-angle formula represents a carbon atom bonded with 2 hydrogens. The omega 1 carbon has 3 bonds to hydrogen (CH3). This long string of hydrocarbons is very hydrophobic. Hydrophobic means it does not mix easily with water. It will repel water. This is a characteristic of a “fatty” substance. It is non-polar. Carbon and hydrogen have similar electronegativity and each of the hydrocarbon components have a neutral charge so there is no region of negative or positive anywhere along the long hydrocarbon chain. It is non-polar. It is fat soluble (fats are non-polar). It is not water soluble (water is polar). The terminating carbon on the left side of this illustration is bonded to a hydroxyl group and a double bond to oxygen. This is referred to as a carboxylic acid functional group. The functional end carbon is the alpha carbon. The term fatty acid refers to the fact that this is a carboxylic acid of a long chain hydrocarbon which is fat soluble. In this first illustration there are no double or triple bonds. Each carbon of the chain is saturated with hydrogen atoms. No further hydrogenation is possible because there are no double or triple bonds. Saturated fatty acids have higher melting points than unsaturated fatty acids. Animal fats are mostly saturated and are solid at room temperature (lard). This is the structure of cis-oleic acid. Cis-oleic acid is the isomer which is found naturally in olive oil. In this fatty acid there is a double bond between carbon 9 and 10 counting from the CH3 terminal carbon (omega). The carbon atoms connected to each other by the double bond are unsaturated with hydrogen. They each only have one bond with hydrogen. In this example, there is only one double bond between omega carbon 9 –10. This is an omega-9 monounsaturated fatty acid. 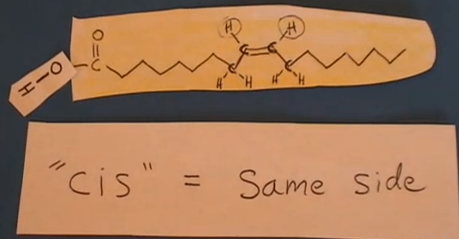 If there were more than one double bond in a fatty acid it would be referred to as a polyunsaturated fatty acid. Unsaturated fatty acids are not as stable as a saturated fatty acid. The double bond between carbons in a hydrocarbon chain invites the formation of a fatty acid radical which can react with oxygen in the process known as rancidification. This can lead to formation of ketones and aldehydes which are responsible for the “rancid” taste and odor of unsaturated oils which have been exposed to heat and oxygen for long periods of time—as in deep fryers. When an unsaturated fatty acid is hydrogenated, the double bond is broken and the fatty acid becomes saturated with hydrogen. Saturated fatty acids are resistant to rancidification. This quality is important to restaurants that serve foods prepared by deep frying. The taste and texture is better and the waste is less when saturated fats are used. Rotation can not occur across a double bond so two configurations are possible. The cis isomer is the configuration found in vegetable oils and is shown here where both hydrogens are on the same side of the double bond. 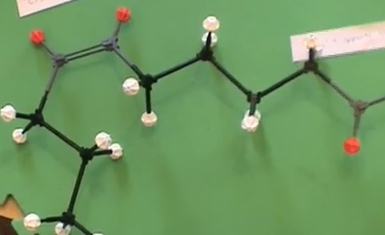 The cis configuration bends the hydrocarbon chain on either side of the double bond as shown in this model. This is the trans isomer of oleic acid, omega 9-trans-oleic acid. This trans-oleic acid can result from incomplete hydrogenation. Commercially, unsaturated oils are hydrogenated to improve shelf-life and prevent rancidification. However, trans fats are an undesirable result when hydrogenation is incomplete as in partially hydrogenated oils. Saturated fats and partially saturated fats improve the taste and texture of fried foods, but increases cholesterol associated with Low Density Lipoprotein (LDL or “bad” Cholesterol). It also decreases the High Density Lipoprotein (HDL or “good” cholesterol). Higher LDL cholesterol and lower HDL cholesterol is associated with coronary disease and atherosclerosis. This has generated controversy between the fast food industry and nutritional health groups. Vegetable oils are composed of mostly unsaturated fatty acids and are liquid at room temperature. Vegetable oils may be hydrogenated and become solid at room temperature. These hydrogenated fatty acids from vegetable sources are are used in cooking as shortening and margarine. Lard and butter are examples of saturated fats from animal sources. Saturated fatty acids in the diet are associated with higher levels of low density lipoproteins (LDL) in the bloodstream. The cholesterol associated with LDL is the cholesterol which is deposited in the walls of coronary arteries in the form of a plaque. These plaques can clog the arteries. They can also rupture which can cause the artery to clot off. This can lead to stroke (clotted artery to brain) or heart attack (clotted artery to heart). Because of its association with plaque formation, LDL cholesterol is referred to as “bad cholesterol.” Because saturated fats and partially hydrogenated vegetable oils (trans fats) are are associated with higher LDL cholesterol levels they are considered less healthy than unsaturated fats. Triglycerides are composed of 3 fatty acids joined to glycerol by ester bonds. Fatty acids are stored in biologic systems as triglycerides. In animals more of the fatty acids are saturated and this results in solid fat at room temperature. In plants more of the fatty acids are unsaturated and this results in most vegetable oils being liquid at room temperature. Fats (triglycerides) are not soluble in aqueous solutions. However, when triglycerides are treated with a strong acid or base in water the ester bond can be broken to release glycerol (water soluble) and the free fatty acid. The hydroxyl (OH) moity of the carboxylic acid molecule does not act like a hydroxide anion. The covalent bond between the oxygen and carbon is stronger than the covalent bond between oxygen and hydrogen in the hydroxyl group. Carboxylic acid is a proton donor, the hydrogen cation dissociates and carboxylic acid anions are produced. The carboxylic acid group can also participate in hydrogen bonds with proteins forming lipoproteins. In the blood stream, fatty acids are transported either as lipoproteins, free fatty acids or triglycerides. Soap is made by treating fat with a strong base (potash = KOH) to convert the fat to water soluble glycerol and free fatty acid anions. This process is referred to as saponification. When soap and water are added to oil, the oil is dispersed into smaller particles (micelles) which can be washed away in the aqueous vehicle. In order for our bodies to absorb fats, the triglycerides in our diet must be hydrolyzed into smaller particles. This reaction is catalyzed by lipase enzymes. While chewing, the fats are mechanically reduced in size and mixed with salivary or lingual lipase. In the stomach they are further reacted by gastric lipase. Finally in the small intestine the job is completed by pancreatic lipase. The anti-obesity drug orlistat, sold by the trade name Xenical®, works by inhibiting the pancreatic lipase enzyme. As a result, fats that are eaten can not be absorbed and therefore pass through undigested. Organic compounds with hydroxyl (OH) functional groups are alcohols. The ‘ol’ ending is added when naming the alcohols. Glycerol is an alcohol. Glycerin is a common name for glycerol. The hydroxyl moiety in alcohols (OH covalently bound to carbon) have much different properties than the hydroxides in strong bases (OH– anion bound to metal cation). When an hydroxyl group is bound to a carbon which is bound to only one other carbon, it is a primary alcohol. If the carbon is bound to 2 other carbons, it is a secondary alcohol. 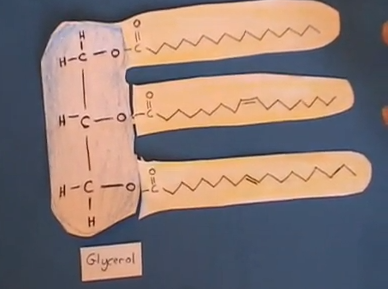 Glycerol consists of 2 primary alcohols bound together by the secondary alcohol between them. Triglycerides are formed in the body by combining a “glycerol backbone” with 3 fatty acid chains.